The current challenge at Open-Minded Crafting Fun is "Vintage", and I chose an image by Lemon Shortbread called Winter Muff Shoujo. Lemon Shortbread is just one of the awesome sponsors for this challenge. The others are Fairy Tangles, The Art of Ronne P. Barton, and The Fantasy Art of Nikki Burnette. 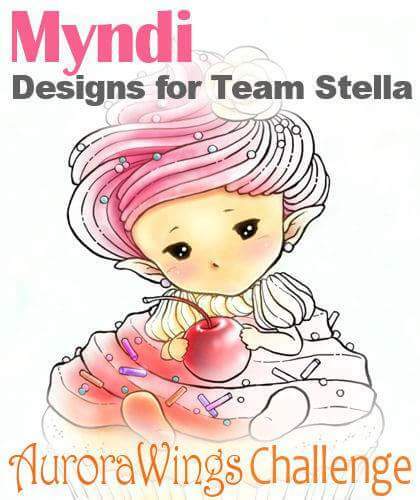 They are offering up some awesome prizes for this challenge as well, so go check out the blog and enter your own project for a chance to win! I don't have any experience with vintage, so I'm not sure this is vintage, but I like how it turned out, nonetheless. I coloured the image with Copics. The papers are from Michele R Designs, the Vintage Frost collection. 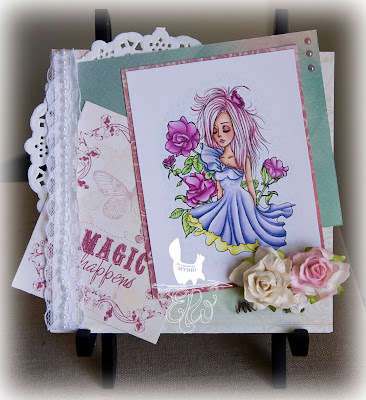 The embellishments are from Live & Love Crafts (as part of our swag bag at the Kit & Clowder retreat), the flowers are from Wild Orchid Crafts. 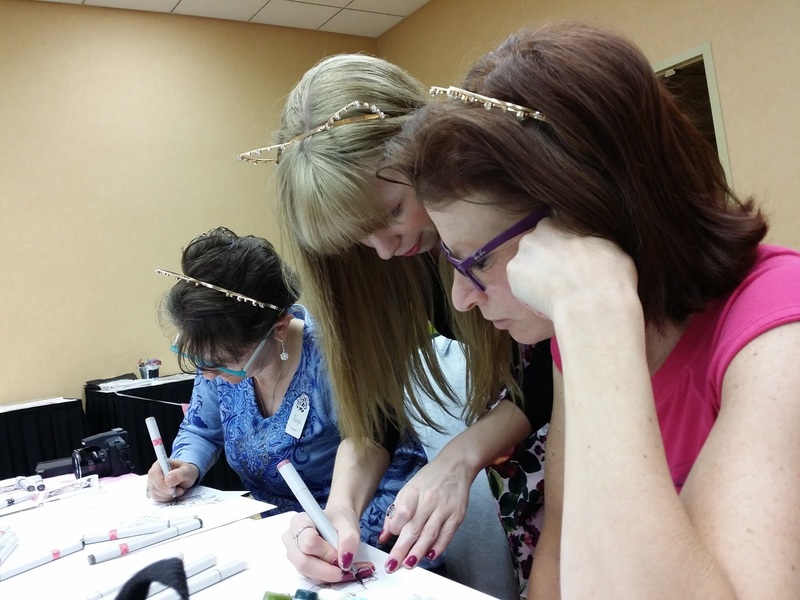 Some sad news to report is that Open-Minded Crafting Fun is closing up shop. you can read Vicky's post about it HERE. It's become too difficult for the ladies to manage the admin side of the page after losing their main admin person a couple months ago. So there will only be two more challenges after the current challenge and then it will be no more. 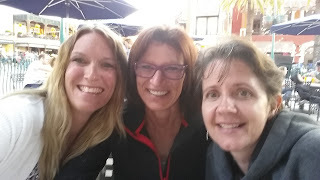 Sad to see it go as those are some fabulous ladies over there doing some awesome things. It's another new release over at The East Wind, and today's image is a new Aurora called "Bloom". All of the papers are from Kaisercraft. I got that lovely pearl lace from the Kit & Clowder retreat, so I'm not sure what company it's from. The flowers are from Wild Orchid Crafts. I coloured the image with Copics using my new Hex Chart, so I used some different colour combos based on that. It's going to be an awesome resource I can tell. 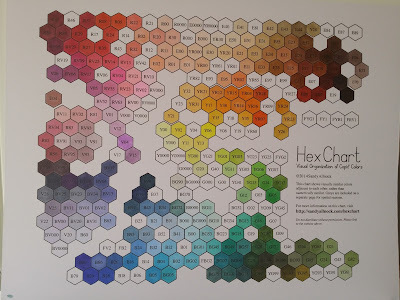 The Hex Chart is something I discovered while at the retreat, and I shared it recently on Kit & Clowder's Facebook page. It seemed to be a big hit, while others weren't keen on spending the $6 on it. I think a lot of time and effort went into the creation of the chart, and you can't get everything for free. It's worth the money to me to see the different combos you can make. It's a different perspective, for sure. Here's mine all coloured up. Obviously, I need to do some more shopping to connect some of the dots. Lol!! Thanks for stopping by and checking out the new release. Hopefully you are a member of the Facebook group and are following the blog. Between the two, there are THREE challenges a month with the chance to earn some free digis. And make sure you are signed up for the newsletter to get your freebie on the 1st of every month! There's a new challenge starting at Tiddly Inks today!! The theme is "Let's Get Gothic". There are so many gothic themed images to choose from in the TI store, so you should have no problem finding one to enter the challenge with. 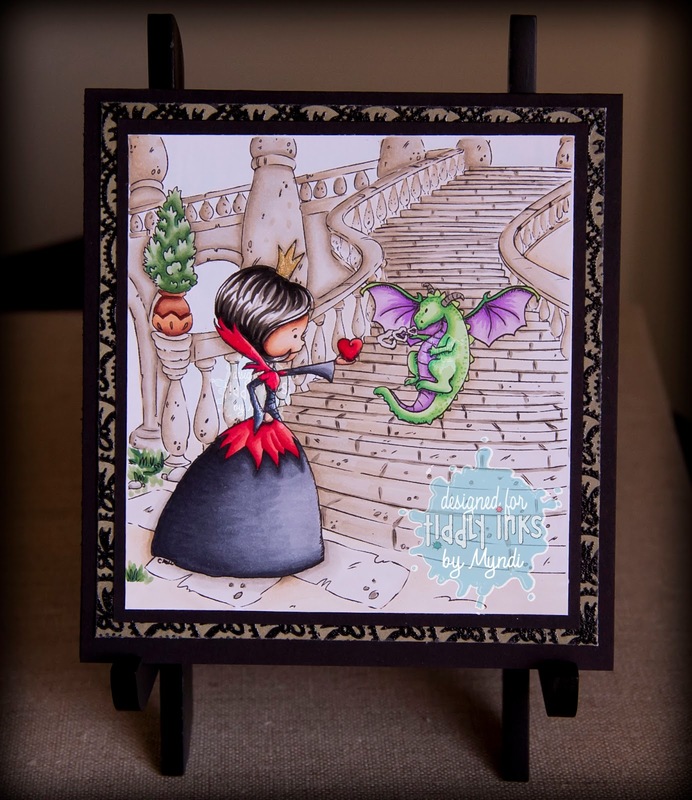 I chose "Baby Dragon Queen" and I used a Make It Crafty digital background also. It took me awhile to colour the entire thing, but I'm pretty happy with how it turned out. I coloured the entire picture with Copics. 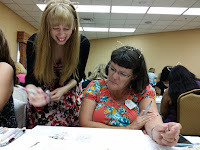 I hope you run over to the Challenge Blog and enter your own creation. Make sure you share with us in the Facebook group as well. I hope you've signed up for the newsletter so you're staying up to date on all the new releases and freebies too! It's the 21st of the month, so it's not only Father's Day AND the Summer solstice, but it's also the start of another challenge over at The East Wind's Facebook page. This month's challenge theme is "Step Away From the DP (designer papers)". So colour any TEW image but don't use ANY designer papers. You will have to use your imagination or go CAS, whatever you like. I picked Diva Lisa "She" for my project. 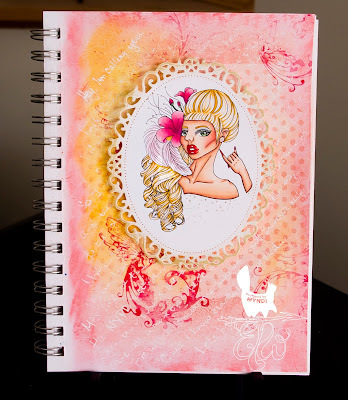 I created my own paper by using a Tim Holtz "Rays" stencil and Lindy's Stamp Gang sprays in Totally 80's. I coloured her with Copics and then fussy cut her out. I have wanted to colour this image for awhile. I printed her off when she was first released, and have been waiting for the opportunity to colour her. I love her hair, and I'm a sucker for great hair. I tried to get the shine of the sprays by taking the photo from an angle, but it's still a little difficult to see. Make sure you go check out the challenge on the Facebook page, and don't forget there are two other challenges on TEW blog HERE. 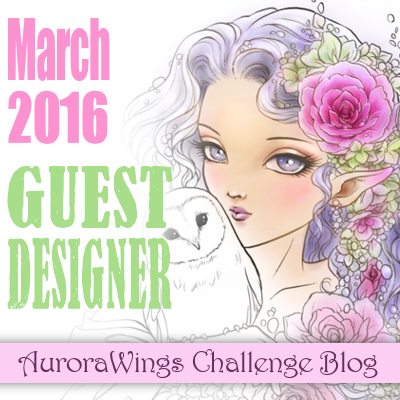 One is with the freebie released on the 1st of the month, the other is a theme challenge. Another awesome week at Slinky Tart! Here is my newest make using Rocking Mom! I've had this stamp for forever but this is the first time I've actually coloured her. I coloured her with Copics and used papers from the DCWV Rock Star mat stack. A few little star brads and she was done. Make sure you check out the blog to see all the other DT ladies' amazing makes this week. And check out our Facebook page. If smexy isn't always what you're looking for, then check out the Spunky Tarts. There are some great images there too, plus awesome digital papers. 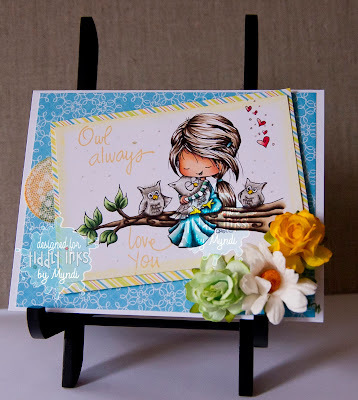 Owl Always Love You Tiddly Inks! 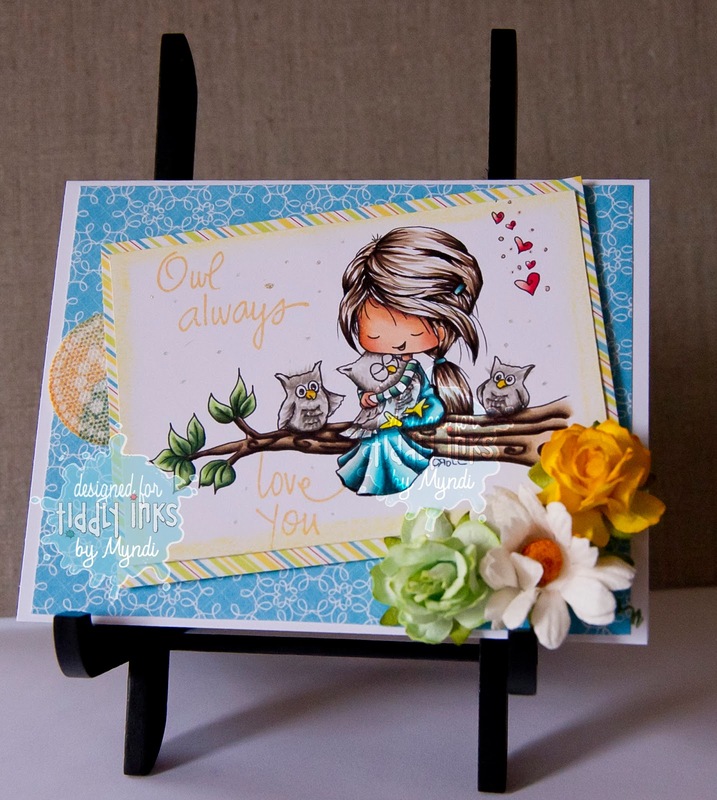 It's Fab Friday at Tiddly Inks, and I'm using a new release called "Owlways Love You". 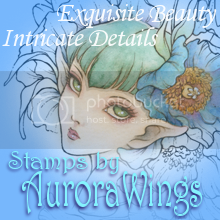 It is available in digital and clear stamp formats. I coloured it with Copics and used some of the new flowers from Wild Orchid, that I just bought at the Kit & Clowder Retreat (see below for more about that bit of fun). I was able to get some live and in person advice from Alyce Keegan about my pleats, which are wrong by the way, so that was surreal. And she was very nice about telling me that they were wrong. lol!! Unfortunately, this was due the day after I came back and I did not have time to recolour it, otherwise it would have been late. I hate to be late, and only being on the TI DT for a few months means I absolutely CANNOT be late. 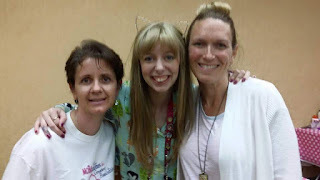 Don't forget there is a Super Power Challenge going on right now at the challenge blog. It's over in just a few days, so head over there now and submit your project! As luck would have it, I needed to make a card for my nephew, and killed two birds with one stone! 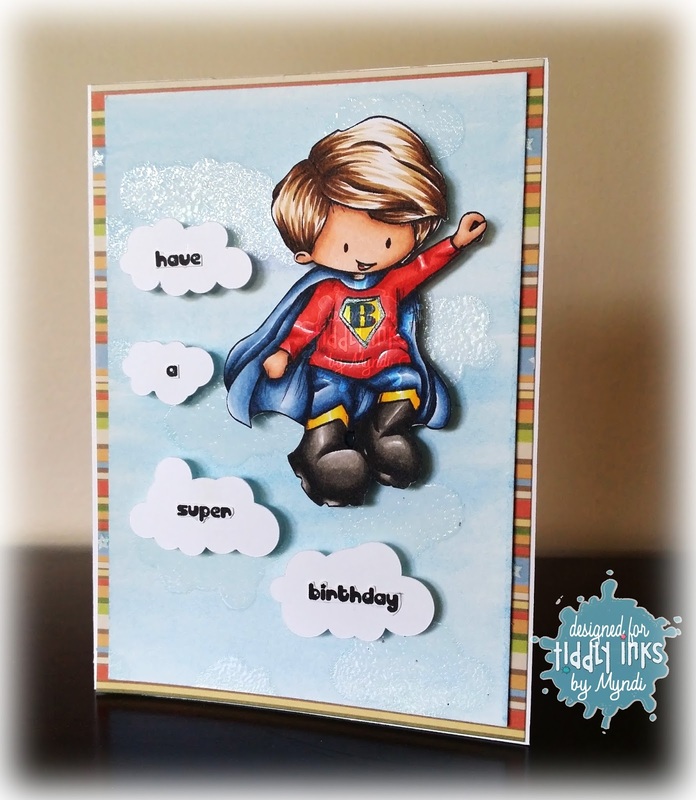 A birthday card for Brody and my DT inspiration for the Super Power challenge. Yay! I am doing a lot of traveling and thought I wouldn't be able to make a project for this challenge, but everything worked out in the end. I used the image "My Super Boy" for this card. I stamped a "B" on the shirt for Brody before I coloured it with Copics. I washed blue watercolour paint over a piece of watercolour paper; then using a cloud stencil I inked in clouds with white pigment ink and then used clear embossing powder to make them pop, but instead of popping they settled into the background. I think next time I would use white embossing powder instead of clear. I used come cloud cut outs to put the words "have a super birthday" and adhered them with pop up foam squares. I also adhered the image with pop up foam. 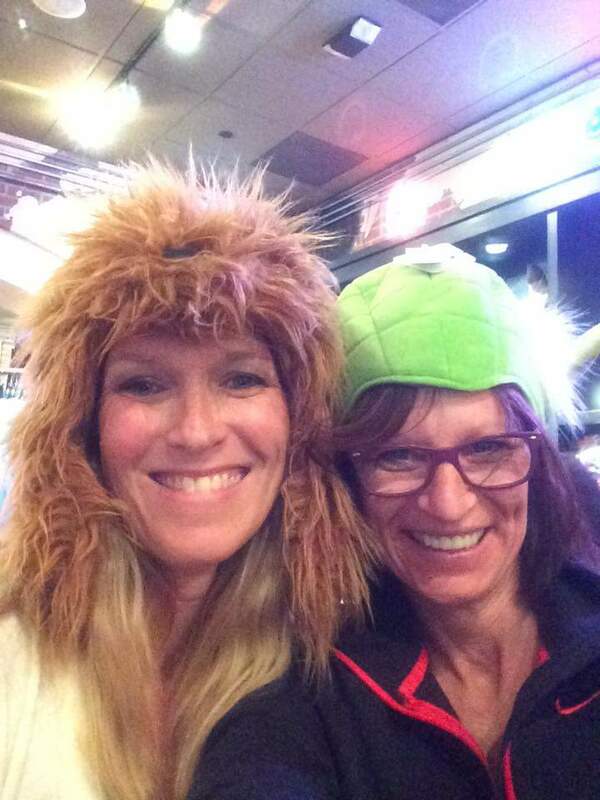 Make sure you head over to the challenge blog and submit a "Super Power" project of your own. In just a few days there will be a new release of some SUPER cute stamps, so keep your eye open for that too. 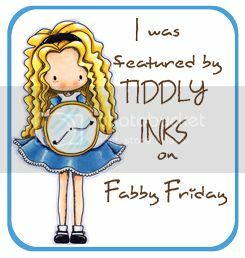 Make sure you're following the blog, getting the newsletter, and are a member of the Facebook group so you don't miss out on anything at Tiddly Inks. 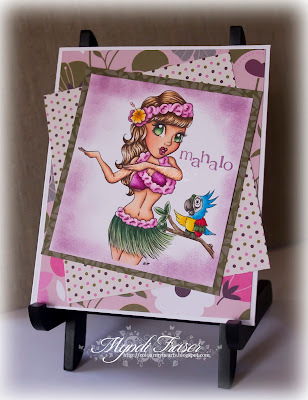 Aloha, and Mahalo for visiting!! My Slinky Tart creation this week is the relatively new "Mahalo" that Tamara created when she must have been in the mood to go to the beach, because she created two "fun in the sun" type images in one week. I never decide which papers I'm going to use before I colour. It's always the other way around. So lucky for me I had papers in my stash that matched perfectly the colours I used to colour her. I kept it CAS because my head is not in my crafting right now. I'm about to embark on some serious travelling the next couple of weeks, and I'm so distracted by that I can't focus on card making. Make sure you check out the "new" and not so secret Facebook page for Slinky Tart. We've made the transition from Secret to Closed so more people can find us and join in on the fun. If you've just stumbled upon this and want to see more, make sure you head over there and join the group. Also, check out the blog and look at some of the awesome makes from the other DT members. They are all FABULOUS!! 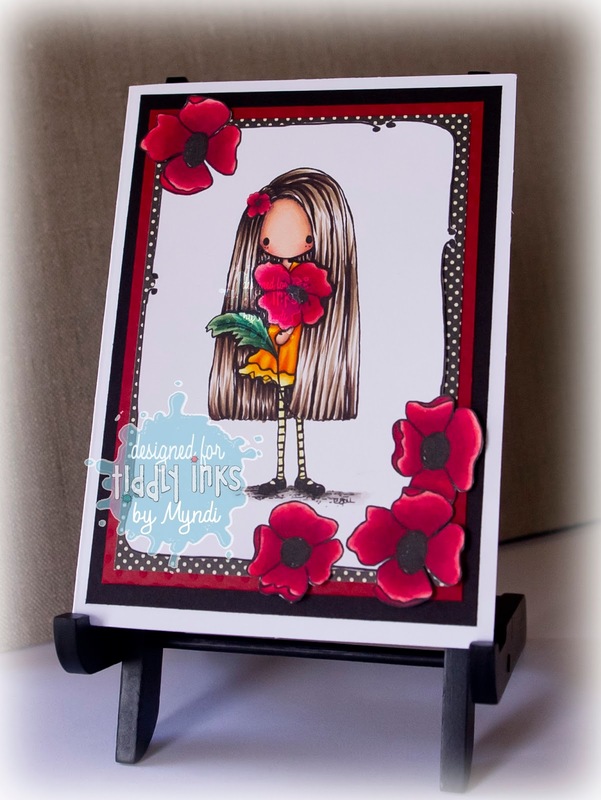 It is another Fab Friday at Tiddly Inks and today I've made a little card with Poppy and Poppy Accents. I am on my way to Wisconsin tomorrow to see my oldest daughter graduate from high school, and my mind is there now and not in my craft room. I just left it CAS this go, but I think with all the bright colours that's okay. Christy is going to have new images on June 15, so the next bit you see from me will probably be those. I will not have anything for you next week because I will be on the road most of the next two weeks. But make sure you check out Tiddly Tuesday and the new challenge going up on June 9 at the TI challenge blog. This month at The East Wind is drag queen month. Unky came up with this wonderful character, Betty Cockus, because she loves drag queens and really it couldn't be at a better time because it is LGBT Pride Month, at least it is in the States. Check out the official proclamation by President Barack Obama HERE. Today's new release is Betty Cockus "Call Me Maybe"
This is my first attempt at a lot of things. 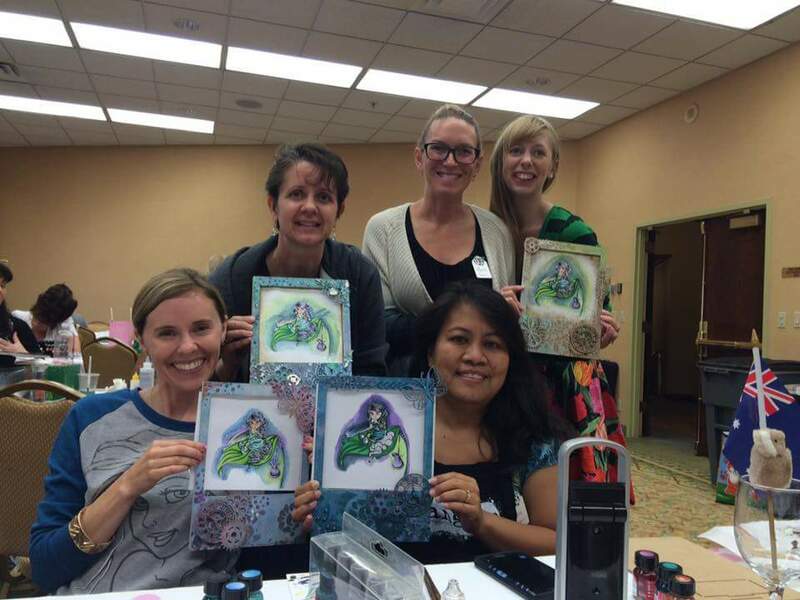 Art journaling, gelatos, stamping with my gelatos, using sprays... I think that's it. I coloured Betty with Copics. I used Faber Castell gelatos for the background. I just scribbled them on, smoothed them out and used a little water to loosen them up a bit. I kept at it until it looked right, and then I used a rubber stamp of a hummingbird spritzed with water and red gelato to do the stamps. Then I used a polka dot stencil and sprayed over that with a Lindy's Stamp Gang spray from the Mermaid Shells pack. Make sure you check out the blog and the Facebook page for challenges, including challenges on Instagram. You can follow me on Instagram (@myndifraser) for updates.